MultiValue Database is a type of NoSQL and multidimensional database. 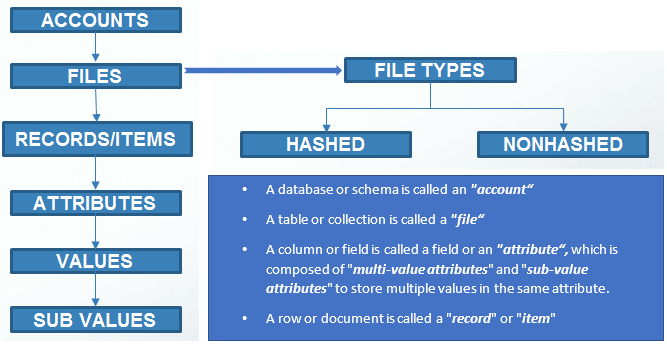 MultiValue databases differ from a relational database in that they have features that support and encourage the use of attributes which can take a list of values, rather than all attributes being single valued. UniVerse was originally developed by VMark Software and UniData was originally developed by the Unidata Corporation. Both Universe and Unidata are used for vertical application development and are embedded into the vertical software applications. Multivalue databases, Unidata & Universe are supported on Solaris & Unix operating systems. AccuTurm, WinIntegrate, Viaduct & Putty tools are predominantly used to access these databases. Triniti provides application development, maintenance and supporting services in Unidata/Universe, UniBasic and PickBasic technologies. Migration of the Multivalued databases to other databases like SQL,DB2,etc..